Disney Donna Kay: Psst...There's A New Place To Get A Dole Whip - And A Great Night's Sleep!! Psst...There's A New Place To Get A Dole Whip - And A Great Night's Sleep!! That's right!! A new place to get a Dole Whip, I can hear Disney fans cheering around the world!! You can enjoy a variety of new dining and recreation experiences with signature touches at the newly re-imagined Disney’s Polynesian Village Resort at Walt Disney World® Resort. As you arrive you will be greeted in the Great Ceremonial House, which features dramatic new décor, a signature chandelier and a new Tiki statue welcoming Guests with his outstretched arms. In search of tropical snacks and libations? You will find them at new dining locations. 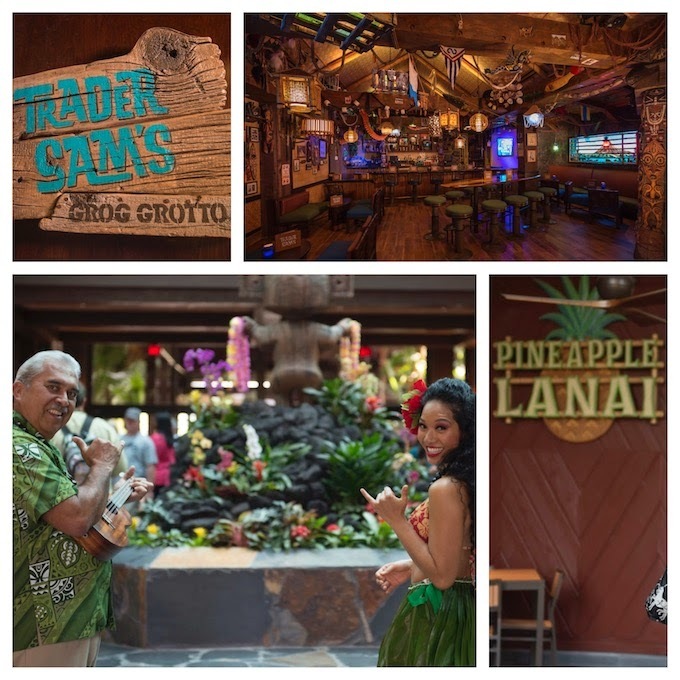 Trader Sam’s Grog Grotto, located off the Great Ceremonial House, is a themed lounge featuring exotic drinks and small plates. Plus, the adjacent Trader Sam’s Tiki Terrace offers views of the marina and Seven Seas Lagoon. The nearby Pineapple Lanai serves the world-famous Dole Whip soft serve ice cream and floats. Lilo’s Playhouse, an enhanced supervised childcare option, allows parents to enjoy an evening date night together. Plus, when open, the resort’s newly redesigned Lava Pool will feature a highly themed children’s water play area, Kiki Tiki Splash Play Area, and an enlarged deck for poolside seating. The newly re-imagined Disney’s Polynesian Village Resort also features 360 new Deluxe Studio accommodations (opening in phases through summer 2015) and 20 over-the-water Bungalows. I'm ready to pack my bags, how about you? I need to plan a trip in the name of research, right?? If you want to check out the re-imagined Polynesian for yourself, as a member of the Guru Travel team of Authorized Disney Vacation Planners, I would love to help. You can email me at donnakay@thewdwguru.com or request a quote. Aloha & Have A Magical Day! !